Unless you’ve been living under a rock, you already know that today is “Back to the Future Day”—the seminal date (October 21, 2015) when the rest of us finally catch up with the time-traveling Marty McFly of 1985, who instantaneously leapfrogged some 30 years into the future, now our present. Of course, Marty’s version of 2015 looks very different from our own. The dazzling, futuristic world of hover-boards, flying cars, and Mr. Fusion Back to the Future II taught us to expect didn’t quite pan out. And while the reasons for that seem mostly self-evident (did anybody really think it would be a good idea to give every American an amateur pilot’s license and a home nuclear reactor? ), the makers of the Back to the Future trilogy felt the need to account for the differences between the world they imagined for us and the one we got. And so, on the new Back to the Future 30th Anniversary Trilogy Blu-ray, we get one new bonus feature that doesn’t appear on any of the previous digital collections—a canonical short called “Doc Brown Saves the World!” In it, we learn that Doc Brown himself, in order to avert an impending global catastrophe, has gone back in time to keep hover-boards and hover-cars—along with Mr. Fusion—from ever being invented. One of the reasons why Back to the Future has remained a perennial is the timeless, bittersweet nostalgia inherent in the idea of catching up with the people we love at different points in their lives. Today’s beautiful and optimistic teens are—quite literally, in the case of the BttF franchise—tomorrow’s autumnal seniors, coping with aching backs and disappointing grandchildren. 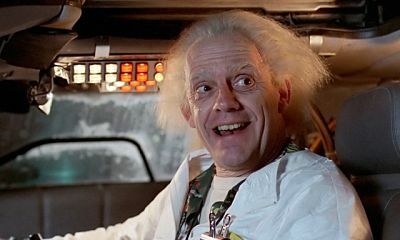 And it is decidedly bittersweet to see Christopher Lloyd, now 76, reprise his role as the manic Doc Brown—far less manic these days, and struggling manfully to get in and out of that damn low-riding DeLorean. Doc Brown’s journey into the past happens off-screen (this is a nine-minute short, after all), but his mission is apparently successful. Global crisis averted! Whether or not the short film itself is successful is probably a matter of individual perspective. It’s always wonderful to catch up with an old friend after a long absence, but always poignant to see the toll that the intervening years (30 of them, in this case), have taken on him—and, by extension, on us. Unless you’re a fanatical completist, it’s probably not worth rushing out to buy the new box set just for the sake of having the new short. But it was awfully nice to see Doc Brown again. In the first Back to the Future film, the 1955 Doc Brown—upon seeing video footage of himself from 1985—exclaims, “Look at me! 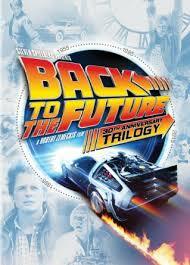 I’m an old man!” Here, at last, is one prediction that the BttF franchise got right. As the saying goes, time eventually catches up with all of us.